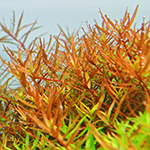 Rotala 'H’ra' has rather narrow leaves and an overhanging or creeping growth. It is probably a variation of Rotala rotundifolia and has much resemblance to Rotala sp. ‘Green’. High light levels, good fertilization and added CO2 will induce almost exclusively creeping growth and a warm, rich orange coloration. This makes it possible to create a dense, orange mid-ground cushion or even an unusual, orange foreground carpet. You will get 5 stems.